The 36th International Plant Show IPM ESSEN started this week in the Messe Essen with this year’s partner country being Denmark. For this reason, Her Royal Highness Princess Benedikte of Denmark was one of the guests at the opening event of the trade fair. The guests of honour also included numerous representatives from the leading professional associations as well as politicians such as the State Secretary Dr Maria Flachsbarth and the Minister for Agriculture of North Rhine-Westphalia Christina Schulze Föcking. And on the first day of the world’s leading trade fair for horticulture, the winners of the Novelties Show and the INDEGA IPM Innovation Award were announced. 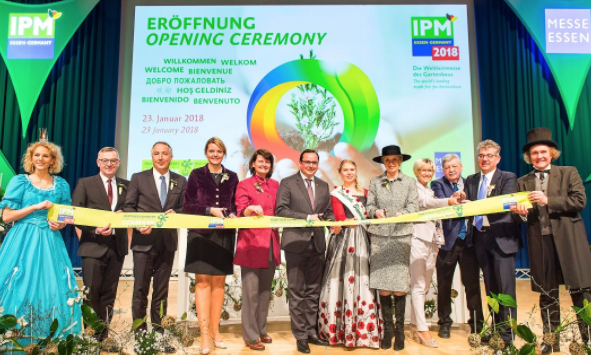 The IPM ESSEN will be hosting international guests from the world of horticulture until Friday. About 1,600 exhibitors from nearly 50 countries have put their innovations spanning the entire value chain of horticulture on display: ranging from plants and technological solutions to floristry and equipment. Princess Benedikte of Denmark rounded off her welcoming speech to the guests of the opening event with the message: “Let flowers speak”. The sister of Queen Margrethe II of Denmark followed up on this with the reveal of the new Danish rose breed “Ocean of Roses”. This new breed is the result of a close cooperation between Queen Genetics, which is one of the most renowned rose breeders in Denmark, and the nursery Thoruplund, which has more than 70 years of experience in breeding various potted plants. The special feature here is that the rose is highly ethylene resistant and can be grown worldwide regardless of the climatic environment. As part of the opening event, a moderated discussion on the future of the horticultural sector was held with contributions from Christina Schulze Föcking (Minister for Agriculture of North Rhine-Westphalia), Jürgen Mertz (President of the Central Horticultural Association), Eva Kähler-Theuerkauf (Chairwoman of the Technical Advisory Board of IPM ESSEN and President of the Association of Horticulture of North Rhine-Westphalia), as well as Frank Lock (President of INDEGA). Key topics were digitalisation in horticulture, the promotion of biological variety and the improvement of the appreciation of horticulture.